Irvington was incorporated as an independent village on March 27, 1874, from portions of Clinton Township. What remained of Clinton Township was absorbed into Newark on March 5, 1902. On March 2, 1898, Irvington was incorporated as a Town, replacing Irvington Village. In 1982, the town was one of four Essex County municipalities to pass a referendum to become a township, joining 11 municipalities that had already made the change, of what would ultimately be more than a dozen Essex County municipalities to reclassify themselves as townships in order take advantage of federal revenue sharing policies that allocated townships a greater share of government aid to municipalities on a per capita basis. The 1967 Newark riots hastened an exodus of families from that city, many of them moving a few short blocks into neighboring Irvington. Until 1965, Irvington was almost exclusively white. By 1980, the town was nearly 40% black; by 1990 it was 70%. On July 1, 1980, Fred Bost, the first black person to serve on the Town Council, was sworn in as East Ward Councilman. Michael G. Steele, the town's first black mayor, was elected in 1990, followed by Sarah Brockington Bost in 1994. The current Mayor is Tony Vauss. Irvington was home to Olympic Park, an amusement park, from 1887 to 1965. The park property straddled the border of Irvington and Maplewood with the main entrance on Chancellor Avenue and a side entrance on 40th St. After the park closed, the merry-go-round was sold and transported to Disney World, in Orlando, FL. The book, Smile: A Picture History of Olympic Park, 1887–1965 written by Alan A. Siegel was published in 1983 by Rutgers University Press. 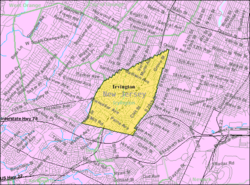 According to the United States Census Bureau, Irvington had a total area of 2.930 square miles (7.589 km2), including 2.928 square miles (7.584 km2) of land and 0.002 square miles (0.005 km2) of water (0.07%). The Elizabeth River (New Jersey)|Elizabeth River]] runs through the city passing Civic Square and Clinton Cemetery. Unincorporated communities, localities and place names located partially or completely within the township include Irving Place. The township is bordered by Maplewood to the west, Newark to the east, Hillside to the south, South Orange to the northwest, all in Essex County; and by Union to the southwest in Union County, New Jersey. As of the 2010 United States Census, there were 53,926 people, 20,093 households, and 12,839.427 families residing in the township. The population density was 18,417.0 per square mile (7,110.8/km2). There were 23,196 housing units at an average density of 7,922.0 per square mile (3,058.7/km2). The racial makeup of the township was 5.64% (3,042) White, 85.41% (46,058) Black or African American, 0.38% (204) Native American, 0.87% (471) Asian, 0.07% (38) Pacific Islander, 5.42% (2,922) from other races, and 2.21% (1,191) from two or more races. Hispanic or Latino of any race were 10.60% (5,716) of the population. There were 20,093 households out of which 30.9% had children under the age of 18 living with them, 27.6% were married couples living together, 27.9% had a female householder with no husband present, and 36.1% were non-families. 31.0% of all households were made up of individuals, and 6.8% had someone living alone who was 65 years of age or older. The average household size was 2.66 and the average family size was 3.33. In the township, the population was spread out with 25.4% under the age of 18, 10.6% from 18 to 24, 30.0% from 25 to 44, 25.1% from 45 to 64, and 9.0% who were 65 years of age or older. The median age was 34.0 years. For every 100 females there were 88.3 males. For every 100 females ages 18 and older there were 84.2 males. The Census Bureau's 2006–2010 American Community Survey showed that (in 2010 inflation-adjusted dollars) median household income was $42,580, and the median family income was $50,798. Males had a median income of $38,033 versus $36,720 for females. The per capita income for the township was $20,520. About 14.4% of families and 16.8% of the population were below the poverty line, including 24.4% of those under age 18 and 16.7% of those age 65 or over. In the township the age distribution of the population shows 28.0% under the age of 18, 10.7% from 18 to 24, 32.3% from 25 to 44, 21.5% from 45 to 64, and 7.5% who were 65 years of age or older. The median age was 32 years. For every 100 females, there were 87.7 males. For every 100 females age 18 and over, there were 81.5 males. Irvington experienced the crack epidemic of the 1980s and has struggled with its aftermath. The township's violent crime rate was six times higher than New Jersey overall and the murder rate eight times higher than statewide statistics. In 2007, the New Jersey State Police reported that Irvington had a violent crime rate of 22.4 incidents per 1,000 population, the highest of all 15 major urban areas in the state. According to the New Jersey State Police Uniform Crime Report for 2013, year-to-year between 2012 and 2013, Irvington experienced an overall reduction in crime of 9% (from 49.6 to 45.2 incidents per 1,000), with reductions coming from overall non-violent crime (18%) and aggravated assault (22%), but an increase in the violent crime rate of 16% from 13.1 incidents per 1,000 to 15.3. Portions of Irvington are part of an Urban Enterprise Zone, one of 27 zones in the state. In addition to other benefits to encourage employment within the zone, shoppers can take advantage of a reduced 3.3125% sales tax rate (versus the 6.625% rate charged statewide, effective January 1, 2018) at eligible merchants. Established in 1996, the township's Urban Enterprise Zone status expires in August 2027. In July 2015, the central business district surrounding the Springfield Avenue bus stop was designated as one of 30 transit villages statewide, qualifying it for incentives for revitalization. Irvington is governed within the Faulkner Act, formally known as the Optional Municipal Charter Law, under the Mayor-Council form of municipal government. The mayor and the seven-member council are elected in non-partisan elections held every other year on the second Tuesday in May to four-year terms of office. The mayor and the three at-large seats are elected together and two years later the four ward seats are elected. The council selects a president, first vice president and second vice president from among its members at a reorganization meeting held after each election. The council is the legislative body of the township and needs a ⅔ majority to make changes to the budget submitted by the mayor. The mayor is the township's chief executive and is responsible for overseeing the day-to-day operations and submitting a budget, but is not eligible to vote on the council and is not required to attend its meetings. As of 2016[update], the mayor of Irvington is Tony Vauss, whose term of office ends June 30, 2018. Members of the Township Council are Council President Charnette Orelien-Frederic (At-large; 2018), First Vice President Renee C. Burgess (At-large; 2018), Second Vice President Sandra R. Jones (South Ward; 2016), Vernal C. Cox Sr. (West Ward; serving an unexpired term ending 2016), October Hudley (At-large; 2018), Paul J. Inman (East Ward; 2016) and David Lyons (North Ward; 2016). As of March 23, 2011, there were 28,545 registered voters in Irvington, of which 14,694 (51.5%) were registered as Democrats, 404 (1.4%) were registered as Republicans and 13,442 (47.1%) were registered as Unaffiliated. There were 5 voters registered to other parties. In the 2012 presidential election, Democrat Barack Obama received 97.9% of the vote (18,538 cast), ahead of Republican Mitt Romney with 1.9% (363 votes), and other candidates with 0.2% (38 votes), among the 19,036 ballots cast by the township's 30,744 registered voters (97 ballots were spoiled), for a turnout of 61.9%. In the 2008 presidential election, Democrat Barack Obama received 96.9% of the vote (18,923 cast), ahead of Republican John McCain with 2.5% (493 votes) and other candidates with 0.1% (29 votes), among the 19,533 ballots cast by the township's 28,879 registered voters, for a turnout of 67.6%. In the 2004 presidential election, Democrat John Kerry received 91.8% of the vote (14,885 ballots cast), outpolling Republican George W. Bush with 7.3% (1,189 votes) and other candidates with 0.3% (80 votes), among the 16,211 ballots cast by the township's 26,594 registered voters, for a turnout percentage of 61.0. In the 2013 gubernatorial election, Democrat Barbara Buono received 86.4% of the vote (6,800 cast), ahead of Republican Chris Christie with 13.1% (1,028 votes), and other candidates with 0.5% (42 votes), among the 8,030 ballots cast by the township's 31,292 registered voters (160 ballots were spoiled), for a turnout of 25.7%. In the 2009 gubernatorial election, Democrat Jon Corzine received 93.2% of the vote (9,218 ballots cast), ahead of Republican Chris Christie with 4.6% (459 votes), Independent Chris Daggett with 0.9% (93 votes) and other candidates with 0.7% (66 votes), among the 9,894 ballots cast by the township's 28,189 registered voters, yielding a 35.1% turnout. The Irvington Public Schools serve students in pre-kindergarten through twelfth grade. The district is one of 31 former Abbott districts statewide, which are now referred to as "SDA Districts" based on the requirement for the state to cover all costs for school building and renovation projects in these districts under the supervision of the New Jersey Schools Development Authority. As of the 2011–12 school year, the district's 12 schools had an enrollment of 7,046 students and 564.0 classroom teachers (on an FTE basis), for a student–teacher ratio of 12.49:1. Schools in the district (with 2011-12 enrollment data from the National Center for Education Statistics) are Augusta Preschool Academy (prekindergarten; 335 students), eight elementary schools — Berkeley Terrace School (K–5; 406), Chancellor Avenue School (PreK–5; 450), Florence Avenue School (K–5; 464), Grove Street School (PreK–5; 363), Madison Avenue School (K–5; 299), Thurgood G. Marshall School (PreK–5; 455), Mount Vernon Avenue School (PreK–5; 732) and University Elementary School (K–5; 565) — along with Union Avenue Middle School (6–8; 767), University Middle School (6–8; 752) and Irvington High School (9–12; 1,461). The district's high school was the 309th-ranked public high school in New Jersey out of 328 schools statewide in New Jersey Monthly magazine's September 2012 cover story on the state's "Top Public High Schools", after being ranked 287th in 2010 out of 322 schools listed. As of May 2010[update], the township had a total of 69.44 miles (111.75 km) of roadways, of which 55.98 miles (90.09 km) were maintained by the municipality, 10.69 miles (17.20 km) by Essex County, 2.60 miles (4.18 km) by the New Jersey Turnpike Authority and 0.17 miles (0.27 km) by the New Jersey Department of Transportation. The Garden State Parkway is the most significant highway in Irvington, passing through the center of the township. It is accessible from exits 143 and 144. Interstate 78 also passes through very briefly along the southeastern border at Exit 54. The most significant local roadway passing through Irvington is County Road 509. The Irvington Bus Terminal, which underwent renovation in the early 2000s, is one of NJ Transit's (NJT) busiest facilities and regional transit hubs. Irvington is served by NJ Transit bus routes 107 to the Port Authority Bus Terminal in Midtown Manhattan; the 1, 13, 25, 27, 37, 39, 42, 70, 90 and 94 to Newark; and local service on the 26, 96 and routes. See also: Category:People from Irvington, New Jersey. Richie Adubato (born 1937), former NBA coach for the Detroit Pistons, Orlando Magic and Dallas Mavericks. Paul Boris (born 1955), former pitcher for the Minnesota Twins. Glen Burtnik (born 1955), singer, songwriter, entertainer and multi-instrumentalist, best known as a former member of the band Styx. Asnage Castelly (born 1979), wrestler competing for Haiti at the 2016 Summer Olympics. Cyrus Durand Chapman (1856–1918), artist and architect who achieved fame with his painting The Wedding Bonnet. Rakeem Christmas (born 1991), basketball player for the Fort Wayne Mad Ants, on assignment from the Indiana Pacers of the NBA. Josh Evans, (born 1991), free safety who has played in the NFL for the Jacksonville Jaguars. Vera Farmiga (born 1973), Academy Award-nominated actress, film director and producer. Charles Goeller (1901–1955), artist best known for precise and detailed paintings and drawings. Ina Golub (1938–2015), fiber artist specializing in Judaica. Mike Goodson (born 1987), running back who has played in the NFL for the New York Jets. Austin Gunsel (1909–1974), National Football League's interim commissioner following the death of Bert Bell on October 11, 1959. William C. Hill (1917-1998), Associate Justice of the Vermont Supreme Court. Frank Hiller (1920–1987), MLB pitcher from 1946 to 1953 who played for the New York Giants, Chicago Cubs, New York Yankees and Cincinnati Reds. Erna Schneider Hoover (born 1926), mathematician notable for inventing a computerized telephone switching method. James J. Howard (1927–1988), represented New Jersey's 3rd congressional district in the United States House of Representatives from 1965–1988. Kareem Huggins (born 1986) running back for the Tampa Bay Buccaneers. Sanford Hunt (1881–1943), member of the Cornell Big Red football team who was a consensus All-American at the guard position in 1901 and later an editor and director of The Newark Sunday Call. Jay W. Jensen (1931–2007), drama teacher. Cullen Jones (born 1984), gold Medalist swimmer at the 2008 Summer Olympics in Beijing in the Men's 4 × 100 m Freestyle Relay. Ron Karnaugh (born 1966), former competition swimmer who represented the United States at the 1992 Summer Olympics. Jerry Lewis (born 1926), comedian, actor, director. Kevin Lyles (born 1973), former sprinter. Boris Malenko (1933–1994), professional wrestler and professional wrestling trainer. Percy A. Miller Jr. (1899–1984), politician who served as Speaker of the New Jersey General Assembly and was Mayor of Irvington from 1934 to 1938. Joe Morello (1928–2011), drummer best known for his work with The Dave Brubeck Quartet. Raheem Morris (born 1976), former head coach of the Tampa Bay Buccaneers. Sybil Moses (c. 1939–2009), prosecutor of the "Dr. X" Mario Jascalevich murder case and New Jersey Superior Court judge. Al-Quadin Muhammad, defensive end for the New Orleans Saints of the National Football League. Napoleon (born 1977), rapper known for being a former member of Tupac Shakur's group, the Outlawz. Rocco Neri (1919–2011), politician who served as a member of the New Jersey General Assembly from 1974 to 1976. Blanche Noyes (1900–1981), pioneering female aviator who was among the first ten women to receive a pilot's license. Bob Perina (1921–1991), running back, quarterback and defensive back who played in the NFL for five seasons. Pras (born 1972), rapper, record producer, songwriter and actor, best known as one of the founding members of the Fugees. Queen Latifah (born 1970), rapper, singer, actress, producer. Robert Randolph, singer and guitarist for Robert Randolph & the Family band. Nicholas Reale (1922-1984), watercolorist with a lengthy career in art and teaching. Nate Robinson (born 1985), former football defensive tackle. Mark Rudd (born 1947), educator and anti-war activist. Al Santorini (born 1948), former MLB pitcher who played for the Atlanta Braves, San Diego Padres and St. Louis Cardinals. O. K. Sato (1871–1921), vaudeville performer best known for his comedic juggling. Artie Schroeck (born 1938), composer and arranger. Craig A. Stanley (born 1955), politician who served in the New Jersey General Assembly from 1996–2008, where he represented the 28th Legislative District. Kay Sutton (1915–1988), film actress. Travis Taylor (born 1990), professional basketball player. Bill Wenzel (1918–1987), cartoonist best known as a widely published good girl artist for men's magazines. Tony Zuzzio (1916-2002), lineman who played for the Detroit Lions during the 1942 NFL season. ^ a b Mayor Tony Vauss, Township of Irvington. Accessed June 22, 2016. ^ a b Sykes, Chris. "Vauss is sworn in as Irvington's new mayor", Essex News Daily, July 11, 2014. Accessed July 18, 2014. "Former Board of Education President and Team Irvington Strong leader Tony Vauss was sworn in as the new mayor of Irvington on Tuesday, July 1, at Christian Pentecostal Church on Clinton Ave.... In Irvington, Durkin was referring to Vauss and his three running mates, Renee Burgess, Charnette Orelien-Frederic and October Hudley, as well as West Ward District leader Vernon Cox. Cox was appointed to serve as the interim West Ward councilman to replace Orelien-Frederic, who vacated that position to assume her new role as councilwoman at large." ^ Business Administration, Township of Irvington, New Jersey. Accessed July 3, 2016. ^ Municipal Clerk, Township of Irvington, New Jersey. Accessed July 3, 2016. ^ a b 2012 New Jersey Legislative District Data Book, Rutgers University Edward J. Bloustein School of Planning and Public Policy, March 2013, p. 129. ^ U.S. Geological Survey Geographic Names Information System: Township of Irvington, Geographic Names Information System. Accessed March 6, 2013. ^ a b c d e f g DP-1 - Profile of General Population and Housing Characteristics: 2010 for Irvington township, Essex County, New Jersey, United States Census Bureau. Accessed March 8, 2012. ^ a b c Profile of General Demographic Characteristics: 2010 for Irvington township, New Jersey Department of Labor and Workforce Development. Accessed March 8, 2012. ^ 2010 Census Populations: Essex County, Asbury Park Press. Accessed July 16, 2011. ^ a b GCT-PH1 Population, Housing Units, Area, and Density: 2010 - State -- County Subdivision from the 2010 Census Summary File 1 for New Jersey, United States Census Bureau. Accessed August 1, 2013. ^ Look Up a ZIP Code, United States Postal Service. Accessed November 25, 2011. ^ Area Code Lookup - NPA NXX for Irvington, NJ, Area-Codes.com. Accessed December 23, 2014. ^ A Cure for the Common Codes: New Jersey, Missouri Census Data Center. Accessed August 14, 2012. ^ a b c Snyder, John P. The Story of New Jersey's Civil Boundaries: 1606–1968, Bureau of Geology and Topography; Trenton, New Jersey; 1969. p. 126 re Clinton Township, p. 128 re Irvington. Accessed August 14, 2012. ^ a b c History of Irvington Archived 2007-01-13 at the Wayback Machine, Irvington Township. Accessed May 9, 2007. ^ Gannett, Henry. The Origin of Certain Place Names in the United States, p. 166. United States Government Printing Office, 1905. Accessed December 23, 2014. ^ "Removing Tiering From The Revenue Sharing Formula Would Eliminate Payment Inequities To Local Governments", Government Accountability Office, April 15, 1982. Accessed September 24, 2015. "In 1978, South Orange Village was the first municipality to change its name to the 'township' of South Orange Village effective beginning in entitlement period 10 (October 1978 to September 1979). The Borough of Fairfield in 1978 changed its designation by a majority vote of the electorate and became the 'Township of Fairfield' effective beginning entitlement period 11 (October 1979 to September 1980). ... However, the Revenue Sharing Act was not changed and the actions taken by South Orange and Fairfield prompted the Town of Montclair and West Orange to change their designation by referendum in the November 4, 1980, election. The municipalities of Belleville, Verona, Bloomfield, Nutley, Essex Fells, Caldwell, and West Caldwell have since changed their classification from municipality to a township." ^ Karcher, Alan J. New Jersey's Multiple Municipal Madness, pp. 119–120. Rutgers University Press, 1998. ISBN 9780813525662. Accessed September 24, 2015. ^ Crime statistics for Irvington, Homesurfer. Accessed August 14, 2007. ^ Areas touching Irvington, MapIt. Accessed December 23, 2014. ^ Compendium of censuses 1726-1905: together with the tabulated returns of 1905, New Jersey Department of State, 1906. Accessed August 1, 2013. No data is listed for 1880 in this source. ^ Thirteenth Census of the United States, 1910: Population by Counties and Minor Civil Divisions, 1910, 1900, 1890, United States Census Bureau, p. 335. Accessed July 24, 2012. ^ Fifteenth Census of the United States : 1930 - Population Volume I, United States Census Bureau, p. 711. Accessed August 1, 2013. Source lists 1880 population and indicates that Irvington population was not listed separately for 1890. ^ a b c d e Census 2000 Profiles of Demographic / Social / Economic / Housing Characteristics for Irvington township, Essex County, New Jersey, United States Census Bureau. Accessed July 12, 2013. ^ a b c d e DP-1: Profile of General Demographic Characteristics: 2000 - Census 2000 Summary File 1 (SF 1) 100-Percent Data for Irvington township, Essex County, New Jersey, United States Census Bureau. Accessed July 12, 2013. ^ DP03: Selected Economic Characteristics from the 2006-2010 American Community Survey 5-Year Estimates for Irvington township, Essex County, New Jersey, United States Census Bureau. Accessed March 1, 2012. ^ African-American Communities, EPodunk. Accessed July 16, 2011. ^ Jones, Richard G. "A Cruel Turn for Irvington, a Town Already Battling Crime and Blight", The New York Times, October 20, 2007. Accessed August 19, 2008. "On Tuesday, the State Police reported that Irvington had the highest violent crime rate of the state's 15 major urban areas, with 22.4 incidents for every 1,000 residents." ^ "Section Seven: New Jersey Municipal-County Offense & Demographic Data, New Jersey State Police. Accessed December 30, 2015. ^ Mazzola, Jessica. "N.J. names 30th transit village, town calls designation 'tremendous'", NJ Advance Media for NJ.com, July 8, 2015. Accessed July 15, 2015. "Park Ridge and Irvington have secured the state's 'transit village' designation, an NJDOT-administered program that connects transit hubs across the state with experts and funding to redevelop the land surrounding them." ^ 2015 Municipal Data Sheet, Township of Irvington. Accessed June 22, 2016. ^ County Directory, Essex County Clerk. Accessed October 31, 2017. ^ Essex County 2014 Municipal Election - Unofficial Results May 13, 2014, Essex County, New Jersey Clerk, updated May 21, 2014. Accessed June 28, 2015. ^ Essex County2012 Municipal Elections - Unofficial ResultsMay 8, 2012, Essex County, New Jersey Clerk, updated May 18, 2012. Accessed June 28, 2015. ^ Khavkine, Richard. "Vauss bests Smith in Irvington mayoral contest", The Star-Ledger, May 13, 2014. Accessed July 18, 2014. "Mayor Wayne Smith was roundly beaten in his bid for a fourth consecutive term, losing to Anthony Vauss, the township board of education's president, by about a 2-to-1 ratio, according to early results tonight.... In the race for three at-large council seats, Renee C. Burgess, Charnette Frederic and October Hudley were ahead by several hundred votes in a race among 12 candidates." ^ About SDA, New Jersey Schools Development Authority. Accessed January 8, 2017. ^ SDA Capital Program, New Jersey Schools Development Authority. Accessed January 8, 2017. ^ District information for Irvington School District, National Center for Education Statistics. Accessed August 4, 2014. ^ School Data for the Irvington Public Schools, National Center for Education Statistics. Accessed August 4, 2014. ^ Augusta Preschool Academy, Irvington Public Schools. Accessed August 1, 2013. ^ Berkeley Terrace School, Irvington Public Schools. Accessed August 1, 2013. ^ Chancellor Avenue School, Irvington Public Schools. Accessed August 1, 2013. ^ Florence Avenue School, Irvington Public Schools. Accessed August 1, 2013. ^ Grove Street School, Irvington Public Schools. Accessed August 1, 2013. ^ Madison Avenue School, Irvington Public Schools. Accessed August 1, 2013. ^ Thurgood G. Marshall School, Irvington Public Schools. Accessed August 1, 2013. ^ Mount Vernon Avenue School, Irvington Public Schools. Accessed August 1, 2013. ^ University Elementary School, Irvington Public Schools. Accessed August 1, 2013. ^ Union Avenue Middle School, Irvington Public Schools. Accessed August 1, 2013. ^ University Middle School, Irvington Public Schools. Accessed August 1, 2013. ^ Irvington High School Archived 2014-08-10 at the Wayback Machine, Irvington Public Schools. Accessed August 1, 2013. ^ New Jersey School Directory for the Irvington Public Schools, New Jersey Department of Education. Accessed December 29, 2016. ^ Staff. "The Top New Jersey High Schools: Alphabetical", New Jersey Monthly, August 16, 2012. Accessed October 10, 2012. ^ "Irvington Bus Terminal To Get Facelift: Wider Bus Lanes, Redesigned Waiting Area, Enhanced Parking and Improved Pedestrian Links are Designated for Aging Facility", NJ Transit press release, October 16, 2003. Accessed October 10, 2012. ^ New Irvington Bus Terminal, RCC Builders and Developers. Accessed October 10, 2012. ^ Essex County Train/Bus service, NJ Transit, backed up by the Internet Archive as of May 22, 2009. Accessed July 16, 2011. ^ Baum, Barry. "Adubato Is Ladies' Man – After Coaching The Boys, Richie's Made Smooth Transition To WNBA", New York Post, August 25, 2000. Accessed September 19, 2015. "And in his second season, Adubato has been more than willing to oblige. With Edison-like thoroughness and preparation, the 62-year-old Irvington, N.J. native has guided the Liberty to its second straight Finals berth." ^ Paul Boris Statistics, The Baseball Cube. Accessed January 19, 2008. ^ Scarantino, Drew Anne. "With A Little Help From His FriendsSept 18: Former member of Styx and Irvington native Glen Burtnik and friends return to the State Theatre for Jersey Beatles Bash IV. ", New Jersey Monthly, August 16, 2010. Accessed December 23, 2014. ^ Evans, Bill. "Rio 2016: N.J. native to wrestle for Haiti, carry flag in Olympics Opening Ceremony", NJ Advance Media for NJ.com, August 3, 2016. Accessed August 12, 2016. "Castelly moved to New Jersey from Haiti when he was 9 years old and he competed for Irvington High School.... He also played football and ran track for Irvington. After graduating from Irvington in 1998, he went on to wrestle for Division II American International in Springfield, Mass." ^ Archives Documents, Manuscripts, Maps, & Photographs – Chapman, Cyrus Durand, (1856–1918), artist, painter., New Jersey Historical Society. Accessed February 9, 2016. "Born in Irvington, N.J., Cyrus Durand Chapman (1856–1918) received instruction in art from his father, later attended the Stevens Institute in Hoboken and subsequently travelled to Europe to train with leading artists." ^ Fischer, Jake. "How Rakeem Christmas's roots made him a top NBA prospect", Sports Illustrated, June 19, 2015. Accessed November 20, 2016. "Born in Irvington, N.J., Christmas was two years old when he and his mother Landra Hamid moved to St. Croix to live with her extended family as she battled Lupus." ^ "Jaguars sign Josh Evans", Jacksonville Jaguars, July 20, 2013. Accessed February 8, 2014. "The Irvington, N.J. native played quarterback and safety at Irvington High School where he rushed for 14 touchdowns and threw for 18 more." ^ Longsdorf, Amy. "New on DVD this week" Archived 2013-08-18 at the Wayback Machine, The Record (Bergen County), January 13, 2012. Accessed June 28, 2015. "Clifton native and former Irvington resident Vera Farmiga makes an astonishingly assured directorial debut with this engrossing study of Corinne (first played by Vera's sister Taissa Farmiga, and then by Vera), a woman who turns to Christianity after she and her family nearly die in a car accident." ^ Charles L. Goeller, Smithsonian American Art Museum. Accessed November 20, 2016. "Born: Irvington, New Jersey 1901"
^ Durbach, Elaine. "Ina Golub, 76, a weaver of fine Judaica; Mountainside artist left a legacy on walls of homes, synagogues", New Jersey Jewish News, October 28, 2015. Accessed November 20, 2016. "Her younger sister, Myrna Wertheimer of Livingston, told NJ Jewish News she remembers Golub's creativity from their earliest childhood. They grew up in Newark and Irvington; their father, Irving, was a distinguished musician and a talented artist." ^ Slater, Darryl. "Former Jets RB Mike Goodson will go to jail if he skips next court hearing, judge says", The Star-Ledger, June 26, 2014. Accessed December 23, 2014. "Gellene said he did not know where in Texas Goodson was. Goodson, who was born in Irvington, attended high school in Spring, Texas, near Houston." ^ via Associated Press. "N.F.L. Picks Interim Chief; Gunsel Is Chosen By Club Owners Acting Chief of Pro League Since Bell's Death to Serve Until January", The New York Times, October 15, 1959. Accessed August 26, 2018. "By profession, he is an accountant. A native of Irvington, N. J., Gunsel now lives in Narberth, Pa., as did Bell." ^ Vermont Legislative Directory, 1979, p. 187. Vermont Office of Secretary of State, 1979. Accessed February 15, 2018. "William C. Hill of Monkton, Republican, was born in Newark, New Jersey, on May 10, 1917. Occupation: Associate Justice, Vermont Supreme Court. Educated in Irvington, New Jersey." ^ Frank Hiller, Baseball-Reference.com. Accessed December 23, 2014. ^ "Erna Hoover", Notable Women Scientists, June 12, 2009. Accessed November 20, 2016. "Born: June 19, 1926 in Irvington, New Jersey, United States"
^ James John Howard, Biographical Directory of the United States Congress. Accessed August 30, 2007. ^ Yasinskas, Pat. "Bucs release Derrick Ward", ESPN.com, August 31, 2010. Accessed June 9, 2011. "Morris also said the move does not mean Huggins, who's from the coach's hometown of Irvington, N.J., and has rushed for a team-best 97 yards on 19 carries this preseason, has won a job." ^ Staff. "Sanford B. Hunt, Newark Editor, 62: Executive of The Sunday Call Dies – Father and Brother Held Post Before Him; An All-American Athlete; Won Football Honors as Star for Cornell – Was Mining Engineer in the West", The New York Times, March 31, 1943. Accessed December 23, 2014. "Mr. Hunt was born in Irvington, N. J., the son of William Tallmadge Hunt and Lucy Bardine Southworth Hunt." ^ "Jay Jensen", Miami Herald, February 19, 2007. Accessed November 20, 2016. "In many ways, Jensen succeeded at teaching drama was because he had tried to make it as an actor himself. Born in Irvington, N.J. on Aug. 4, 1931, his entertainment career began as the dance partner of his college classmate, the actress Carroll Baker, and the pair often performed for U.S. troops at MacDill Air Force Base in Tampa." ^ Mallozzi, Vincent M. "U.S. Swimmer Hopes to Inspire", The New York Times, August 3, 2008. Accessed June 9, 2011. "Cullen Jones does not want to be described as an athlete who came out of nowhere, burst onto the scene or made a surprising debut. 'I don't like any of those descriptions,' said Jones, a 24-year-old swimming sensation from the impoverished city of Irvington, N.J. 'I've been on a long, hard road to get to where I want to be, so I don't consider myself a surprise.'" ^ Ron Karnaugh Archived 2014-12-02 at the Wayback Machine, Sports-Reference.com. Accessed December 23, 2014. ^ Sragow, Michael. "Funny Bones", The New York Times, June 9, 1996. Accessed March 9, 2012. "Mr. Levy locates the seeds of Mr. Lewis's king-size ambitions and insecurities in his struggling show-biz family (his parents devoted themselves primarily to his father's career as a would-be Jolson), and in his sometime hometown of Irvington, N.J., which in the 1930s was rife with German-American support for Hitler." ^ Dunaway, James. "Track and Field; Georgetown Breezes To Title", The New York Times, March 7, 1994. Accessed June 10, 2018. "The top individual performer of the day was Kevin Lyles of Seton Hall. The tall junior from Irvington, N.J., won the 400 meters in 46.90 seconds and came back to win the 200 in 21.31 seconds." ^ Oliver, Greg; and Johnson, Steve. The Pro Wrestling Hall of Fame: The Heels, p. 76. ECW Press, 2010. ISBN 9781554902842. Accessed November 20, 2016. "Boris Malenko — The Great Malenko, or, more formally, Professor Boris Maximilianovich Malenko of the School of Hard Knocks — was a character cut from the heel fabric long since out of production, a master strategist who was worlds ahead of his contemporaries in manipulating fans' emotions... Born in 1933 in Newark, New Jersey, to a Polish immigrant father and American mother, Larry Simon was raised in nearby Irvington, and did some amateur wrestling at different YMCAs as a teenager." ^ Staff. "Percy Miller Jr., 85, a Former Legislator and Mayor in New Jersey", The New York Times, November 28, 1984. Accessed November 20, 2016. "Percy A. Miller Jr., a former New Jersey State Assemblyman and a former Mayor of Irvington, N.J., died Sunday at Martin Memorial Hospital in Stuart, Fla."
^ Smith, Steve. "Joe Morello, Drummer with Dave Brubeck Quartet, Dies at 82", The New York Times, March 13, 2011. Accessed July 16, 2011. "Joe Morello, a jazz drummer whose elegant, economical playing in the Dave Brubeck Quartet sounded natural and effortless even in unusual time signatures, died on Saturday at his home in Irvington, N.J. He was 82." ^ via Associated Press. "Irvington native Raheem Morris named head coach of Tampa Bay Buccaneers", The Star-Ledger, January 17, 2009. Accessed June 9, 2011. "The 32-year-old, a 1994 Irvington High School graduate, oozed enthusiasm during a news conference to introduce him as Jon Gruden's successor on Saturday, even if he did not offer specifics about his plan to help the Bucs climb back among the NFL's elite." ^ Grimes, William. "Sybil R. Moses, Prosecutor and Longtime New Jersey Judge, Dies at 69", The New York Times, January 24, 2009. Accessed June 9, 2011. "Sybil Rappaport was born in Newark and grew up in Irvington, N.J."
^ Lanni, Patrick. "University of Miami dismisses Don Bosco star Al-Quadin Muhammad, report says", NJ Advance Media for NJ.com, August 28, 2016. Accessed May 1, 2017. "Before his dismissal, Muhammad, an Irvington native, missed the entire 2014 season after being suspended for his involvement in a fight following the team's spring game." ^ Dante. "Napoleon – Outlaw on the Rise", LatinRapper.com, March 8, 2005. Accessed February 9, 2016. "Mutah Wassin Shabazz Beale was born in Newark, New Jersey, one of four sons of Spanish and African American roots. Tragic events in his childhood led to living with his grandmother in Irvington, New Jersey, he would eventually be connected to 2pac through Shakur's Godbrother Kadafi and became part of the Dramacydal group." ^ Narvaez, Alfonso A. "Essex Sheriff and 2 Aides Indicted With a Former Democratic Chief; Sheriff Seeking Re-Election", The New York Times, August 24, 1979. Accessed December 23, 2014. "Also named in the indictment were William J. Leonardis, 59, of Newark, chief inspector of the Sheriff's office since 1972, and Rocco Neri, 60, of Irvington, undersheriff since 1975." ^ Staff. "Mrs. Noyes Gets Air Post; Irvington Woman Is Appointed Federal Marking Pilot. ", The New York Times, August 14, 1936. Accessed August 26, 2018. "Mrs. Blanche Noyes of Irvington, N.J., was appointed today an air-marking pilot for the Bureau of Air Commerce by Eugene L. Vidal, the director. Mrs. Noyes has been flying since 1929 and was one of the first ten women pilots to receive an air transport license." ^ Staff. "Robert I. Perina '43" Archived 2013-12-27 at the Wayback Machine, Princeton Alumni Weekly, October 9, 1991. Accessed December 23, 2014. "Bob Died Aug. 2, 1991, in Madison, Wisc., at the age of 70. A native of Irvington, New Jersey., he graduated from Newark Academy in Livingston, from Princeton in 1943, and from the Univ. of Wisconsin Law School in 1953." ^ Staff. "Irvington's Pras Michel of The Fugees: Americans just want jobs", NJ.com, May 20, 2016. Accessed November 20, 2016. ^ Guthrie, Marissa. "'Life' of a Queen: Latifah digs deep for an HBO movie", copy of article from New York Daily News, March 8, 2007, accessed April 19, 2007. "Latifah—who'll turn 37 this month—grew up in Irvington, N.J."
^ Wise, Brian. "Eclectic Sounds of New Jersey, Echoing From Coast to Coast", The New York Times, February 8, 2004. Accessed March 9, 2012. "Raised in Irvington, Mr. Randolph, 25, learned to play pedal steel guitar at age 16 by watching so-called Sacred Steel players in the House of God Church, an African-American Pentecostal denomination in Orange." ^ Nicholas Albert Reale (1922), Artprice. Accessed January 8, 2018. "Birth place: Irvington, NJ "
^ Vrentas, Jenny. "Irvington grad Nate Robinson headed to Giants", The Star-Ledger, April 28, 2008. Accessed December 23, 2014. "Nate Robinson, a DT from Irvington, will sign a free-agent contract with the Giants, he said this morning." ^ Who is Mark Rudd?, MarkRudd.com, dated July 2005. Accessed April 19, 2007. "Mark was born on June 2, 1947 in Irvington, N.J."
^ "Former New Jersey Born Italian /American Pitcher: Al Santorini (1968–1973)", centerfieldmaz, May 18, 2014. Accessed December 23, 2014. "Alan Joel Santorini was born May 19, 1948 in Irvington, New Jersey. Santorini attended Union high school starring in baseball by the mid sixties." ^ Staff. "O. K. Sato, the Juggler, Dead", The New York Times, March 25, 1921. Accessed November 20, 2016. "Frederick L. Steinbrucker, long known on the vaudeville stage as O. K. Sato, the juggler, died suddenly of heart disease Wednesday at his home in Irvington, N. J." ^ Home page, Artie Schroeck. Accessed February 8, 2014. "Artie Schroeck was born in Irvington, New Jersey, October 10, 1938, the youngest of 4 boys." ^ Art Sinsaburgh, San Francisco Museum of Modern Art. Accessed November 20, 2016. "1924, Irvington, New Jersey"
^ Hanley, Robert. "Irvington Mayor Indicted On 5 Counts of Corruption", The New York Times, April 5, 2002. Accessed December 23, 2014. "State Assemblyman Craig A. Stanley, a Democrat who declared his candidacy for mayor of Irvington on Wednesday, called the indictment a 'low blow' for the city's residents." ^ Sullivan, Joseph F. "Man In The News; Agile Nominee For Jersey High Court", The New York Times, October 11, 1984. Accessed November 17, 2017. "Mr. Stein was born June 13, 1933, in Newark and attended schools in Irvington, where he was raised. He graduated from Duke University in 1954 and the university's Law School in 1956." ^ "Interview with Gary Stein", Rutgers University] Center on the American Governor, January 22, 2009. Accessed November 17, 2017. "Q: Where are you from? Gary Stein: I was born in Newark. From the age of seven on, grew up in Irvington." ^ "Kay Sutton", The New York Times. Accessed December 23, 2014. ^ Barmakian, Ed. "Monmouth's Taylor thriving just three years after first playing organized basketball", The Star-Ledger, November 28, 2008. Accessed November 20, 2016. "That was obvious the first day he showed up for practice at Union High after his family moved into town from Irvington. His first two years of high school, Taylor had attended St. James Prep in Newark, which did not have a basketball team." ^ Cahillane, Kevin. "Art; Nostalgia, Wearing Stilettos", The New York Times, December 4, 2005. Accessed August 26, 2018. "He was born in Irvington in 1918, grew up in Union, married his high school sweetheart on his 24th birthday, had two daughters, served in World War II and spent 30 years in Atlantic Highlands." ^ Miller, Stephen. "Robert Zoellner, Alpine Associates Founder, Dies at 82", Bloomberg News, December 31, 2014. Accessed December 31, 2014. "Robert Emil Zoellner was born on April 26, 1932, in Irvington, New Jersey, to Emil John Zoellner and the former Anna Elizabeth Morton." ^ Tony Zuzzio, Pro-Football-Reference.com. Accessed June 10, 2018. Wikimedia Commons has media related to Irvington, New Jersey. Chisholm, Hugh, ed. (1911). "Irvington" . Encyclopædia Britannica (11th ed.). Cambridge University Press.